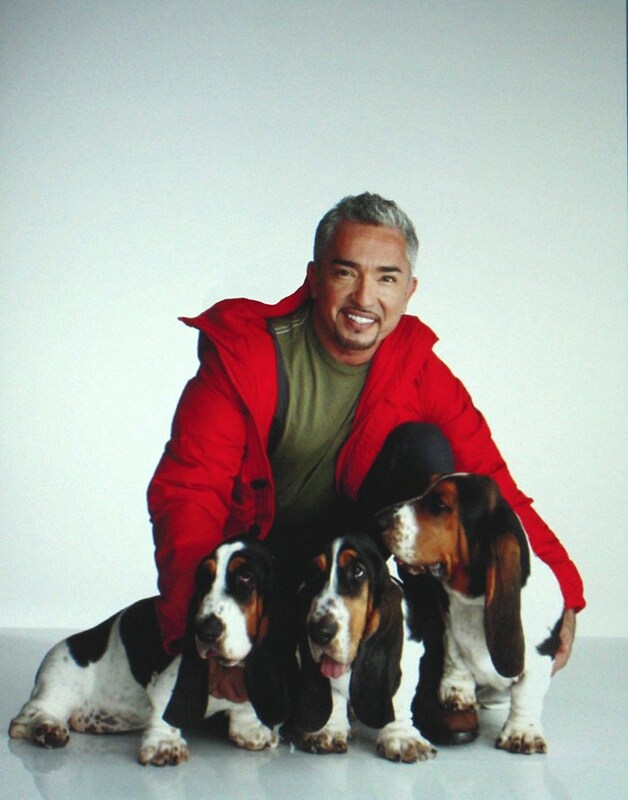 In 2008 at the request of Dawn Smith, the director of the basset hound rescue ranch, Daphneyland, we took two of our dogs to a photo shoot for Cesar Millan aka The Dog Whisperer. We took two of Joy's puppies because they wanted puppies between the ages of four to six months. It was a great experience for us and the dogs. We'd like to thank Cesar and his staff for their hospitality and the photographer for his patience. Sierra and Cruiser had a super time. The images above were all taken by me or another person with my camera. 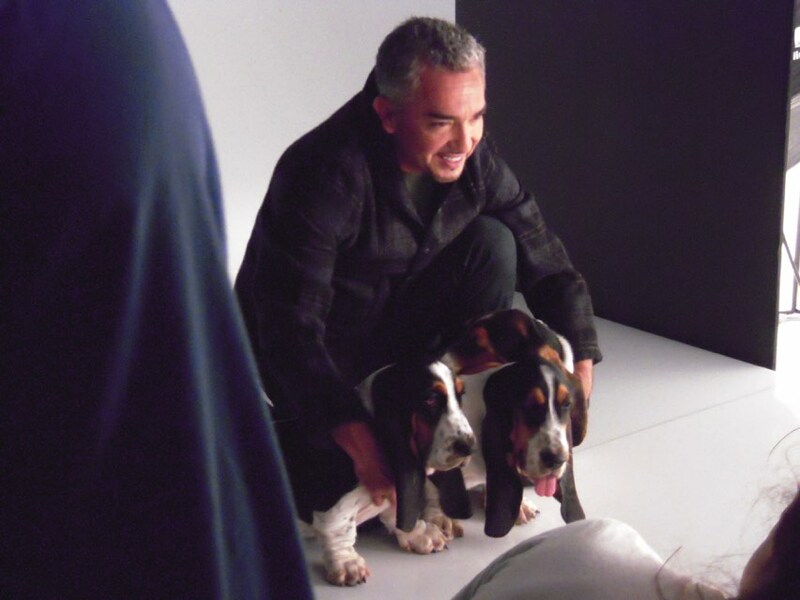 Both Cesar Millan and the photographer invited those of us present at the photo shoot to take our own pictures and Cesar was very generous to offer to pose with us and our dogs while another person took a photo with my camera. This was a very gracious offer on both Cesar Millan and the photographer. The bassets in the picture are Cruiser and Sierra from Joy’s first litter. Sierra went on to become an AKC Champion and Cruiser is living in a wonderful pet home. 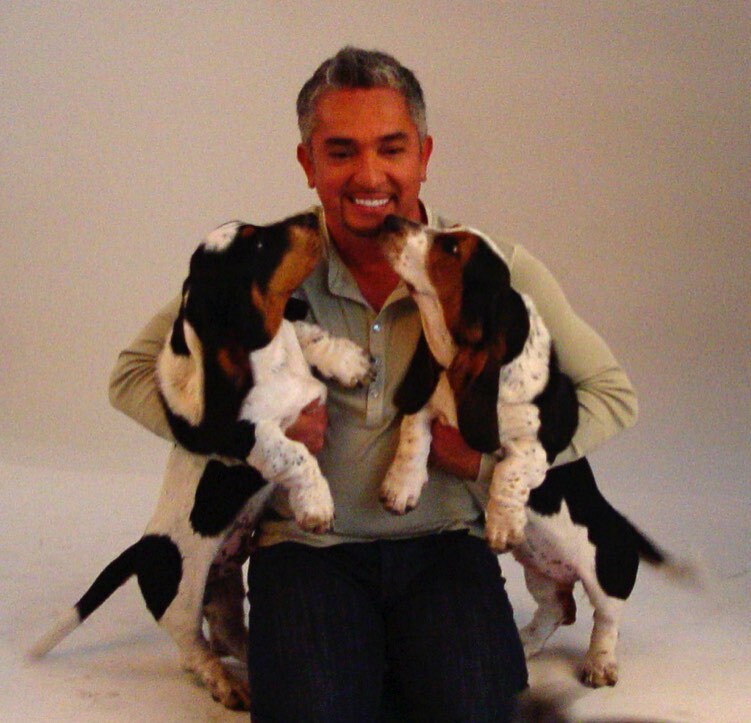 We did another photo shoot with Cesar Millan with puppies from Joys second litter (see below). A quick wardrobe change and more photos. Sierra kissing up to Cesar. As can be seen below the photo shoot didn't go as smoothly as the more formal portraits make things look. Sierra and Cruiser's favorite part of the day except for the treats. In 2010 we received an email from Cesar’s staff to see if we had another litter of basset hound puppies that would be available for a photo shoot in Los Angeles. Surprisingly their timing was perfect. Joy had her second litter. 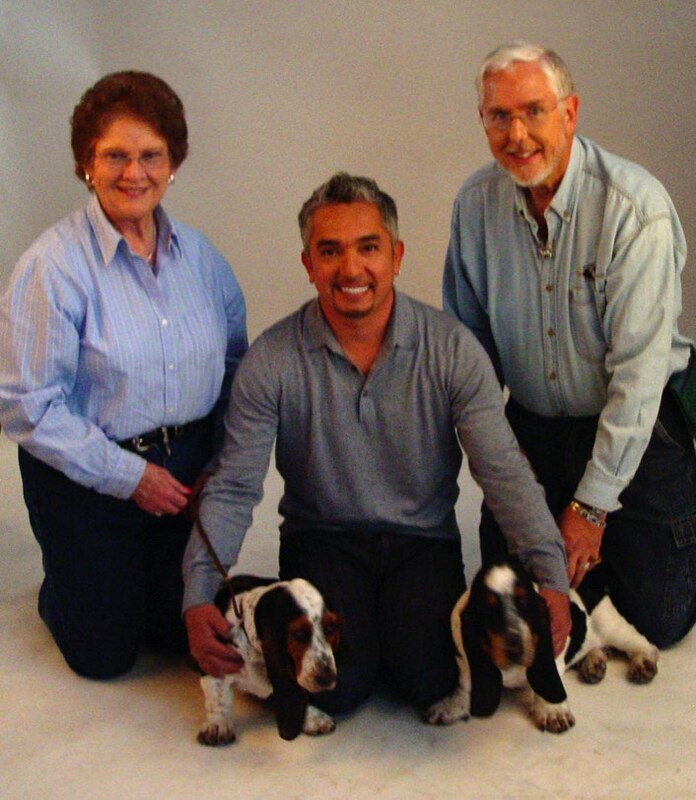 These photos were taken at our second photo shoot with Cesar Millan. Pictured with him are Miss Sassy, Doc and Jesse from Joy’s second litter. All three of them have now become AKC Champions and Sassy and Doc are also Grand Champions. Miss Sassy lives with us while Doc and Jesse have wonderful owners. The set for the second photo shoot was very closed and full of all kinds of assistants. Taking pictures from outside the set was very difficult. As you can see by the pictures they were not well trained. Mr. Millan had nothing to do with their lack of training. All three are now AKC Champions or Grand Champions. 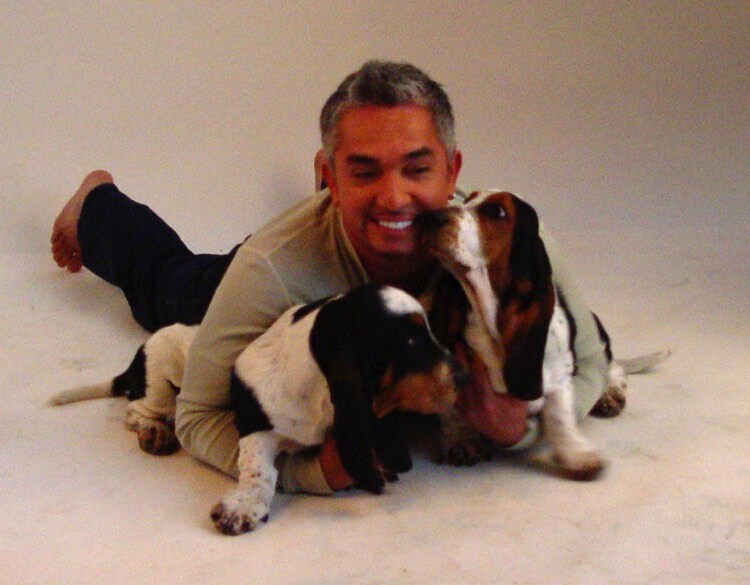 PLEASE NOTE: Other than sharing our basset hounds with Cesar Millan and his staff for these two photo shoots we at Woebgon Bassets have no connection with him or his methods for training dogs. We certainly are not experts on this subject. This page is not meant to be an endorsement for Cesar Millan or the “Dog Whisperer” television program nor do we encourage people to specifically seek his advise. 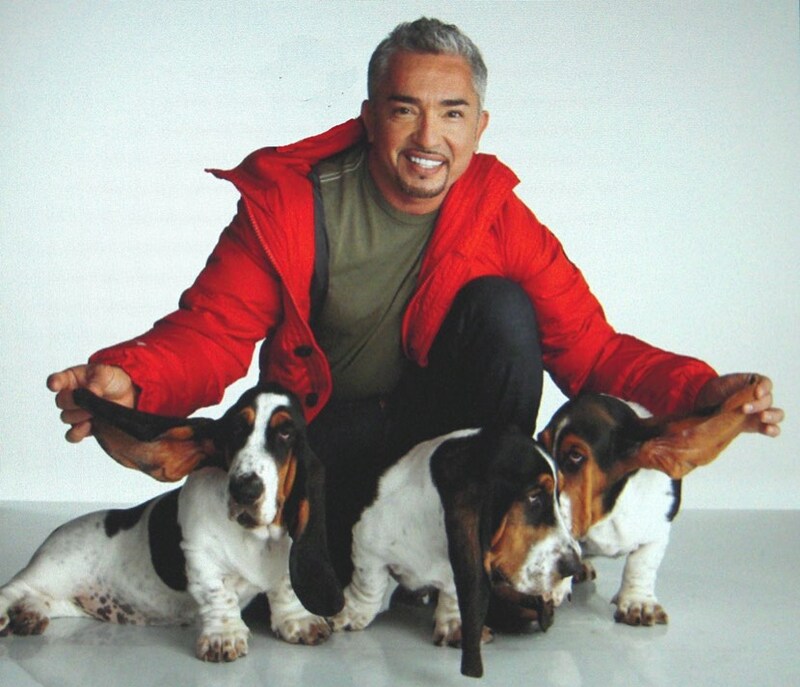 Cesar Millan is just one of many who are involved in working with dogs and their behaviors. We greatly appreciate the opportunities we’ve had to meet Mr. Millan and have pictures of our puppies taken with him. Both were great experiences for us and the dogs. We were thrilled with the opportunities.